* 3 PCS in 1 package, can organizing all your essentials, and meet all your daliy needs.date or everyday use. * Large main compartment to fit a 14.1" laptop ,your wallet, ipad ,cellphone ,cosmetics, sunglass. What does the bag durable? ----- Finished in top quality faux leather, top quality gold hardware, removable straps ,Strict quality control for each product. Want to find a way to be more in orderly in your bag ? ----KasPala 3 PCS set bag can help you with that ,Large bag can fits your laptop, books, Umbrella, best friend for you work or date with friends. crossbody bag can be as cosmetic Bag ,when you have a date with your friends want to fix makeup, you can quick to find what you need. ----Of course,39 /3=13 USD/PCS,You save a lot ! Is it suitable as a gift ? ----Sure! This set bag is great idea as gift for your family, or you could share this set with your family and friends together. it is really wonderful ! Material: made by synthetic leather, gold hardware,Zipper Closure; Adjustable and Removable Shoulder Strap 44 inch. 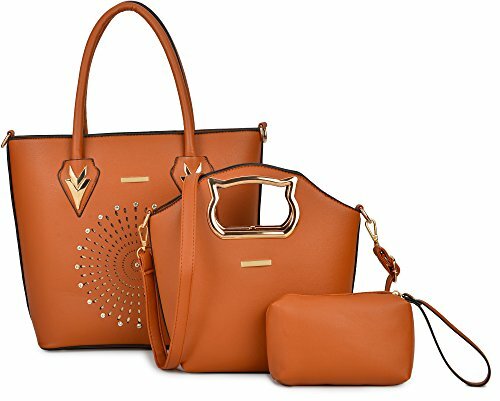 3 in 1 , one price you could get 3 piece,1 handbags +1 crossbody +1 purse+1 long shoulder strap ,All of these bags coordinate and the handles and zippers all work great,save you lot of money. Interior:1 x zipper pocket, 2 x mini open pockets for keys/card. All stuff can be well organized inside. Inner Lining was made by Fabric. This Gift set is perfect as 2018 Christmas gift or birthday gift for your wife ,mom,girls,and family，or you could share this set with your friends or family. If you have any questions about this product by KasPala, contact us by completing and submitting the form below. If you are looking for a specif part number, please include it with your message.